There’s a new star in the sewing world. And it will help you shine. Presenting the Luminaire Innov-ís XP1. Adorned with revolutionary StitchVision Technology which, through an innovative projection of light, allows you to find perfection in every stitch. 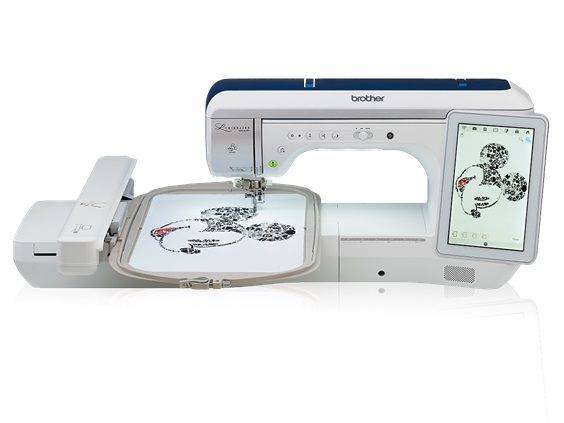 It’s an enlightened sewing, embroidery and quilting experience, powered by technology that’s light years ahead. Introducing StitchVision Technology, a revolutionary new system for virtually perfect stitch positioning* and more precise previews via an intelligent projection of light. Preview, audition and edit designs and stitches directly on your fabric. *In some cases, there may be some difference between the projector view and the actual embroidery stitch-out, based on materials used. Experience the freedom and comfort of sewing on 65 square inches of included workspace, giving you the power to handle virtually any project with ease. A generous needle to arm distance of 13.1" is our largest ever, able to fully accommodate a rolled king-sized quilt. LARGE 10 5/8" X 16"
Make your projects larger than life with the new large 10 5/8" X 16" frame, the largest that Brother currently offers. This extra-large frame has efficient rubber plates on both sides of the inner frame to hold fabric securely. A new ergonomic Spring Lever Release enables easier, clamp free hooping. Simply place your fabric in the hoop and engage the lever. The simple and intuitive 10.1" capacitive touch screen works like a tablet with familiar sliding, swiping, scrolling and pinch-to-zoom for viewing detailed steps, categories and designs. The user interface offers large, defined crystal-clear icons, and color navigation for easy viewing. It's like having a built-in camera and scanner! The ability to scan the entire embroidery area provides virtually endless creative options and helps ensure that all your projects are perfect. Enhanced My Design Center integrates with our industry-first InnovEye Plus Technology to offer design capabilities at your fingertips, all without a PC. It's a great way to create custom personal works of art, and a really fun way to create embroidery! Open the top cover to easily attach the included magnetic Dual King Spool Thread Stand. This space saving innovative stand helps ensure proper thread delivery as well as prevent broken stitches and uneven tension. This thoughtfully designed feature allows for quick needle plate changes without the use of a screwdriver. No need to remove your extension table, embroidery unit or accessory tray - saving you time and effort for a seamless sewing experience. Let your imagination and creativity run wild with the extensive library of over 1,100 built-in embroidery designs, including Disney, Anna Aldmon, Zundt, ZenTangle and Pierre Joseph Redoute. Our already generous thread color palette has been enhanced with the addition of Iris, Floriani, Simplicity, and Polyfast brands. This page has been viewed 2181 times.